Managing a kingdom is hard. There's all sorts of issues of every manner always cropping up. In order to keep order and peace, the queen has requested that the Guildmasters of the different heroic orders in Tessandor pick from among their numbers those would would best work at fixing each issue. 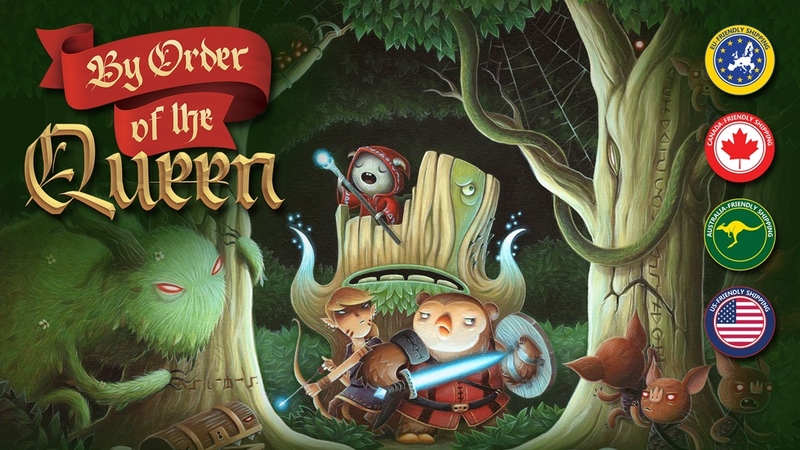 That's the story behind By Order of the Queen, a new board game up on Kickstarter. In the meantime, let's fill up on some bite-sized gaming stories, shall we? Today we have: Rotten Factory Miniatures - Rise of the Dark Power On Wspieram, Totentanz Miniatures Tercio May releases Posted, Last 5 Days For Aether Captains on Kickstarter, New Ancestral Ruin 32mm and 40mm base deals from Tabletop-Art, Junk Spirit Games announces By Order of the Queen, Dark Siren Available Now From Kabuki Models, Load Board Game Coming To Kickstarter Soon, 15mm WW2 and Vietnam Passenger Trays Available From Dark Art Miniatures, A new design appears From Red Panda Miniatures, Khurasan releases 15mm Soviet T-64B, Brigade Models Release 15mm Neo-Soviet Conscripts, Final Day For Aeon's End Up On Kickstarter, Hope Board Game Coming To Kickstarter June 9th, and Cross promotion between Fragged Empire and FAITH: The Sci-Fi RPG.